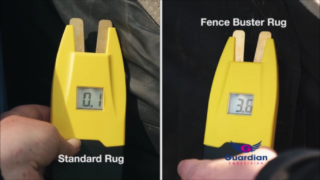 You can see in the picture above, a voltmeter testing the inside of a normal rug when held against a fence that’s providing 3,800 volts, and the second photo shows a voltmeter on the inside of a Guardian rug, which shows the full 3,800v pulse from the fence going through to the inside of our rug. You can do this test at home yourself with a voltmeter and any normal rug vs a Guardian rug. Of course we insist your electric fencing is erected as per the manufacturers guidelines; the normal voltage for an electric fence for horses is between 3,000-10,000 volts – if you have a horse that like to escape, we recommend keeping the voltage at the higher end of that range.